Citation Information: J Clin Invest. 2018. https://doi.org/10.1172/JCI97631. Tumor cure with conventional fractionated radiotherapy is 65%, dependent on tumor cell-autonomous gradual buildup of DNA double strand break (DSB) misrepair. Here we report single dose radiotherapy (SDRT), a disruptive technique that ablates >90% of human cancers, operates a distinct dual-target mechanism, linking acid sphingomyelinase (ASMase)-mediated microvascular perfusion defects to DNA unrepair in tumor cells to confer tumor cell lethality. ASMase-mediated microcirculatory vasoconstriction post-SDRT conferred an ischemic stress response within parenchymal tumor cells, with reactive oxygen species triggering the evolutionarily conserved SUMO Stress Response, specifically depleting chromatin-associated free SUMO3. Whereas SUMO3, but not SUMO2, was indispensible for homology-directed repair (HDR) of DSBs, HDR loss-of-function post-SDRT yielded DSB unrepair, chromosomal aberrations and tumor clonogen demise. Vasoconstriction blockade with the endothelin-1 inhibitor BQ-123, or ROS scavenging post-SDRT using peroxiredoxin-6 overexpression or the SOD-mimetic tempol, prevented chromatin SUMO3 depletion, HDR loss-of-function and SDRT tumor ablation. We also provide evidence of mouse to human translation of this biology in a randomized clinical trial, showing 24Gy SDRT, but not 3x9Gy fractionation, coupled early tumor ischemia/reperfusion to human cancer ablation. The SDRT biology provides opportunities for mechanism-based selective tumor radiosensitization via accessing SDRT/ASMase signaling, as current studies indicate this pathway is tractable to pharmacologic intervention. Citation Information: J Clin Invest. 2018. https://doi.org/10.1172/JCI96063. 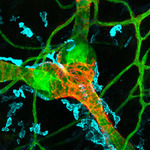 Impaired lymphangiogenesis is a complication of chronic complex diseases, including diabetes. VEGF-C/VEGFR3 signaling promotes lymphangiogenesis, but how this pathway is affected in diabetes remains poorly understood. We previously demonstrated that loss of epsins 1 and 2 in lymphatic endothelial cells (LECs) prevented VEGF-C–induced VEGFR3 from endocytosis and degradation. Here, we report that diabetes attenuated VEGF-C–induced lymphangiogenesis in corneal micropocket and Matrigel plug assays in WT mice but not in mice with inducible lymphatic-specific deficiency of epsins 1 and 2 (LEC-iDKO). Consistently, LECs isolated from diabetic LEC-iDKO mice elevated in vitro proliferation, migration, and tube formation in response to VEGF-C over diabetic WT mice. Mechanistically, ROS produced in diabetes induced c-Src–dependent but VEGF-C–independent VEGFR3 phosphorylation, and upregulated epsins through the activation of transcription factor AP-1. Augmented epsins bound to and promoted degradation of newly synthesized VEGFR3 in the Golgi, resulting in reduced availability of VEGFR3 at the cell surface. Preclinically, the loss of lymphatic-specific epsins alleviated insufficient lymphangiogenesis and accelerated the resolution of tail edema in diabetic mice. Collectively, our studies indicate that inhibiting expression of epsins in diabetes protects VEGFR3 against degradation and ameliorates diabetes-triggered inhibition of lymphangiogenesis, thereby providing a novel potential therapeutic strategy to treat diabetic complications. Citation Information: J Clin Invest. 2018. https://doi.org/10.1172/JCI97192. Myocardial infarction (MI) arising from obstruction of the coronary circulation engenders massive cardiomyocyte loss and replacement by non-contractile scar tissue, leading to pathological remodeling, dysfunction, and ultimately heart failure. This is presently a global health problem for which there is no effective cure. Following MI, the innate immune system directs the phagocytosis of dead cell debris in an effort to stimulate cell repopulation and tissue renewal. In the mammalian adult heart, however, the persistent influx of immune cells, coupled with the lack of an inherent regenerative capacity, results in cardiac fibrosis. Here, we reveal that stimulation of cardiac lymphangiogenesis with VEGF-C improves clearance of the acute inflammatory response after MI by trafficking immune cells to draining mediastinal lymph nodes (MLNs) in a process dependent on lymphatic vessel endothelial hyaluronan receptor 1 (LYVE-1). Deletion of Lyve1 in mice, preventing docking and transit of leukocytes through the lymphatic endothelium, results in exacerbation of chronic inflammation and long-term deterioration of cardiac function. Our findings support targeting of the lymphatic/immune cell axis as a therapeutic paradigm to promote immune modulation and heart repair. Citation Information: J Clin Invest. 2018. https://doi.org/10.1172/JCI92077. Red blood cells (RBCs) influence rheology, release ADP, ATP and nitric oxide suggesting a role for RBCs in hemostasis and thrombosis. Here we provide evidence for a significant contribution of RBCs to thrombus formation. Anemic mice showed enhanced occlusion times upon injury of the carotid artery. A small population of RBCs was located to platelet thrombi and enhanced platelet activation by a direct cell contact via the FasL-FasR (CD95) pathway known to induce apoptosis. Activation of platelets in the presence of RBCs led to platelet FasL exposure that activated FasR on RBCs responsible for externalization of phosphatidylserine (PS) on the RBC membrane. Inhibition or genetic deletion of either FasL or FasR resulted in reduced PS exposure of RBCs and platelets, decreased thrombin generation and reduced thrombus formation in vitro and protection against arterial thrombosis in vivo. Direct cell contacts of platelets and RBCs via FasL-FasR were shown after ligation of the inferior vena cava (IVC) and in surgical specimens of patients after thrombectomy. In a flow restriction model of the IVC, reduced thrombus formation was observed in FasL–/– mice. Taken together, our data reveal a significant contribution of RBCs to thrombosis by the FasL-FasR pathway. Citation Information: J Clin Invest. 2018. https://doi.org/10.1172/JCI96477. Medial vascular calcification, associated with enhanced mortality in chronic kidney disease (CKD), is fostered by osteo-/chondrogenic transdifferentiation of vascular smooth muscle cells (VSMCs). Here, we describe that serum- and glucocorticoid-inducible kinase 1 (SGK1) was upregulated in VSMCs under calcifying conditions. In primary human aortic VSMCs, overexpression of constitutively active SGK1S422D, but not inactive SGK1K127N, upregulated osteo-/chondrogenic marker expression and activity, effects pointing to increased osteo-/chondrogenic transdifferentiation. SGK1S422D induced nuclear translocation and increased transcriptional activity of NF-κB. Silencing or pharmacological inhibition of IKK abrogated the osteoinductive effects of SGK1S422D. Genetic deficiency, silencing, and pharmacological inhibition of SGK1 dissipated phosphate-induced calcification and osteo-/chondrogenic transdifferentiation of VSMCs. Aortic calcification, stiffness, and osteo-/chondrogenic transdifferentiation in mice following cholecalciferol overload were strongly reduced by genetic knockout or pharmacological inhibition of Sgk1 by EMD638683. Similarly, Sgk1 deficiency blunted vascular calcification in apolipoprotein E–deficient mice after subtotal nephrectomy. Treatment of human aortic smooth muscle cells with serum from uremic patients induced osteo-/chondrogenic transdifferentiation, effects ameliorated by EMD638683. These observations identified SGK1 as a key regulator of vascular calcification. SGK1 promoted vascular calcification, at least partly, via NF-κB activation. Inhibition of SGK1 may, thus, reduce the burden of vascular calcification in CKD. Citation Information: J Clin Invest. 2018. https://doi.org/10.1172/JCI97459. Tumor angiogenesis occurs through regulation of genes that orchestrate endothelial sprouting and vessel maturation, including deposition of a vessel-associated extracellular matrix. CD93 is a transmembrane receptor that is up-regulated in tumor vessels in many cancers, including high-grade glioma. Here, we demonstrate that CD93 regulates integrin-β1-signaling and organization of fibronectin fibrillogenesis during tumor vascularization. In endothelial cells and mouse retina, CD93 was found to be expressed in endothelial filopodia and to promote filopodia formation. The CD93 localization to endothelial filopodia was stabilized by interaction with multimerin-2 (MMRN2), which inhibited its proteolytical cleavage. The CD93-MMRN2 complex was required for activation of integrin-β1, phosphorylation of focal adhesion kinase (FAK) and fibronectin fibrillogenesis in endothelial cells. Consequently, tumor vessels in gliomas implanted orthotopically in CD93-deficient mice showed diminished activation of integrin-β1 and lacked organization of fibronectin into fibrillar structures. These findings demonstrate a key role of CD93 in vascular maturation and organization of the extracellular matrix in tumors, identifying it as a potential target for therapy. Citation Information: J Clin Invest. 2018. https://doi.org/10.1172/JCI98734. Haemostasis requires conversion of fibrinogen to fibrin fibres that generate a characteristic network, interact with blood cells, and initiate tissue repair. 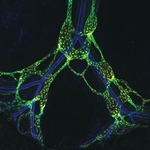 The fibrin network is porous and highly permeable, but the spatial arrangement of the external clot face is unknown. Here we show that fibrin transitioned to the blood-air interface through Langmuir film formation, producing a protective film confining the clot. We demonstrated that only fibrin is required to form the film, and that it occurred in vitro and in vivo. The fibrin film connected to the underlying clot network through tethering fibres. It was digested by plasmin and formation of the film was prevented with surfactants. Functionally, the film retained blood cells and protected against penetration by bacterial pathogens in a murine model of dermal infection. Our data show a remarkable aspect of blood clotting, in which fibrin forms a protective film covering the external surface of the clot, defending the organism against microbial invasion.